Mistywood was nice. The staff and the dining area were nice. It was clean and it was a little older in terms of the decorating style, but the people that live there love it. They have a computer room and a place where they watch movies. It was just too overwhelming and too outrageously beyond expensive. Mistywood seemed very nice. It was great and the people who did the tour were very nice. I met some of the residents there and I enjoyed it. The staff was all pleasant and I didn't meet anybody who wasn't. The apartments were very nice. Some were spacious, and some were tiny, which I didn't like. I liked the activities they had there, and I liked the kitchen. The food was very well-prepared. If someone's looking for a place like this, I would recommend it. Mistywood had nice dining area facilities that looked like restaurants. The people who represented them were courteous, well informed and welcoming. The property itself and their program going from one property to another if you were traveling was the best I've seen. It's highly recommended. It just was not the right time for us. They offered us food, but we did not accept. The volunteers and the management were well versed in the benefits of that community, and I was impressed by the people who live there. They were welcoming and doing a good job there. They were all proficient, knowledgeable, and service oriented. The front was beautiful, but the back could've been a little better organized. They did the right things. The natural gas was way off in an enclosure, and they had a little bare ground that people could let their dogs out in. I don't have complaints. It looked very well maintained, and the interior was quite nice. The staff at Mistywood was helpful and seemed to be concerned about their clientele. The place was very clean and well-kept. We saw a 1-bedroom apartment, the restaurant, and the recreational areas. The apartment had a bedroom, a separate living area, and a kitchen. Mistywood had a wide range of activities, but it cost a lot more money. They would do just about everything for you and had everything included. It was gorgeous, but they didn't have full kitchens, just a kitchenette, and you have to eat their meals. You can bring in a microwave, but they didn't have a stove. They played cards and had outings. If some of the residents want to get together, they make their own groups and do things. They had movies and did all sorts of activities. Mistywood was a beautiful, well-kept, and well-lit place. It looked like they took care of their residents and were very personable. Mistywood was our number one choice before my mother in law made a different choice. It’s very open, airy, and in a beautiful location, and when you come in it feels very cheery. They have a beautiful entrance. The core person was very helpful and nice, and he showed us a number of different rooms which was really helpful to see. The rooms were nice, but were fairly of odd shape -- like we saw one that was kind of a wedge room; the living room part was kind of wedge-shaped. We were actually there as if we were going to move in. The kitchens are minimalist; they're very inexpensive construction. The doors on the cabinets look really cheap; same as the bathroom cabinets. They're literally right in the middle of the room, so there really isn't a place where it would separate it. It's just against the wall in the middle of your whole living area. There was no separation. We didn’t like that at all as there was no way to make it go away. There’s a tiny little counter; it didn’t come with a stove or a microwave, but there was a miniature refrigerator. The kitchen was really bad. It isn’t friendly or nice for her to buy appliances. The room and the format itself were nice. We did go back for lunch when we thought we were going to live there, but the serving staff being badly trained and young. One of them came up and asked if we wanted a salad. The menu on the table did not match what was being offered during the meal. There was no way to know what food was being offered, and the server didn’t tell us what our choices were before we ordered. When we got to the part where there were desserts, she asked if you'd like a piece of cake, and it turned out it was really cake; it was banana bread, but it was cake. My mother in law said sure, she wanted a piece of cake. The girl said, "We have ice cream too," so my mom said, "I'd like a little ice cream too," and the girl said, "No, I will get in trouble as I am only allowed to give people one serving." The ice cream was a size of a chicken egg; it was dinky and half melted. Three of the people in the table didn’t even get dessert. It felt like they really limited the portion size. The lack of food was really a detriment there because they didn’t have a kitchen, so you really have to be eating down the hall all the time, and the restaurant doesn’t have a good selection. I live in Mistywood. It has three meals a day: breakfast is at 8:00, lunch is at 12:30, dinner is at 5:30. You’re either there at those times or you don’t eat. Some of the other facilities have open kitchens throughout the day. Mistywood could probably improve on that, so that I could sleep until 10:00. I won’t be able to get a fancy breakfast, but I could get something to eat. Or if I decided that I’d rather sleep in than go down and have breakfast, then I could do it. What suits me would be a light breakfast when I get up, something to eat maybe at about 4:00 in the afternoon, and probably have a snack in my room for bedtime. I have a lot of respect for the personnel here. As a matter of fact, I and another person were the people who organized the once-a-year tip for the staff. This is done by the residents with nothing to do from management, and we’ve raised a very substantial amount of money to divide up for Christmas gifts for the staff. When I sit for the first dinner with a new resident or sometimes a prospective resident, I tell them that if they’re not careful, in the first six months they’re here they'll gain 10 lbs. I also tell them that they can ask for small servings; otherwise, they’ll get a plate that would please a truck driver. They have several activities each day from 9:00 to 10:00 every morning, including Saturday and Sunday, including some kind of an exercise. One day, it’s tai chi; another day, it’s weights and balances. It’s all physically active stuff. In the dining room on Wednesdays, we have word hunts on the table, which gets you credit for the little auction they have once a year. The rooms and apartments at Mistywood are fine. The food is a little salty but they fixed that and everything is fine. They have fantastic staff. They have a lot of activities for the residents. They should have an assisted living unit. We really liked the presentation of Mistywood. When we went there for a visit, they were playing games. The staff was very interesting. It's the one that I liked the best, but it's the most expensive too. I just love them. They had a room that they showed me, and I was in it for about a half hour. It felt like home to me. I really liked it. They do not have a swimming pool, but they have everything else that you'd want. It's all inclusive, and they had very good food. They hold special meals. My daughter and I went to a tea party. Everybody I talked to that had seen it absolutely loves it. They have a very nice dining room. They just kept redoing the interior. It's a beautiful place located right in the heart of Roseville, and it's only half a mile from my sister's house. It was perfect for me except for the price. The managers live there on the premises also, so there's always someone there 24 hours. The atmosphere and everything was really very nice, and the staff was overly helpful. I would recommend Mistywood without hesitation. I visited Mistywood, and everybody seemed friendly. The location was good -- it's on a busy street, so it's accessible to buses, but not close enough to stores to the point she could walk to them. They had some card games and arts and crafts, and the people that live there dress nicely for lunch. The staff were very friendly, very persistent, and fully informed. I went to Mistywood. The staff was just very nice. I'm sure that the people that live there enjoy it. In fact, one of my friends from church is living there, and she enjoys it. I had lunch there, and it was good. We had a private room, but it was very small and very depressing. I think they had all kinds of activities if you're at the right age, but I'm not just there yet, and it was depressing to me. I've been living in Mistywood for three months now, and it is a wonderful place. The food is wonderful; it is too good that I've gained 12 pounds. The managers are absolutely wonderful, and they are there 24 hours a day. They've got big studios, one bedrooms, and two bedrooms, which are beautiful. With dining, it's four to a table. It's got a beautiful atrium where people meet, and they have entertainment there sometimes. They do have some chair exercises and speakers, and a happy hour every Friday where they serve wine. The staff is wonderful. They have young people that serve the food in courses. They ought to have more mind stimulating things. Everybody is very friendly, and the place is very clean. Mom really liked the room she got, and she brought in her cats. She gets three meals a day. It is very safe and secure, and it is close to where I live. Mistywoods has all what we needed, the staff is very good, and there is always somebody on the premises. They are accommodating and helpful. The place itself was beautiful. It was bright and cheerful, and there was always something going on. The one thing I really liked more about Mistywood was the layout of it. You walk in, there was the dining room, there was everything going on, so everything was just really cool, and I really liked that. Of course, the rooms themselves were spread out, but the community rooms were all within the front of the building so I really liked that because, in a way, it feels that you don't really have to go over that far if you want to find out what was going on. The staff was nice. They also served three meals a day. They did arrange for me to have lunch, and the food was good. They did have probably more variety, but that was not that big of a deal, and they do serve breakfast, lunch, and dinner. They have movie nights, little parties, St. Patrick's Day, Valentine's Day, on-site Bible studies, and different games and things that they play. It was so nice and it might be something you can afford. It was very well-kept and pretty. I like the friendliness at Misty Wood. It’s very pleasant. I like the idea of having a bedroom, a living room, bathroom, and a kitchenette. I was looking for a place that had bible stud,y and this one does. The staff is wonderful. They’ve been able to answer all of my questions. I meet staff members in the hallways or in the dining room, and they’re very cordial. I like the way they serve the food. They would go in to have a meal. They ask if you’d like to have another person come sit with you. I saw a more active group at Mistywood. I went there because a lot of people at the other facility that I used were familiar with this facility. It’s kind of a good location because it’s not that far from the other facility that we visit for medical services, so I thought it would be smart to give it a go. It was a very nice facility and it is a relatively new facility, so it’s very warm and inviting. The place is extremely clean, the staff was very nice, and I felt that the people there were more into pressuring people to make a quick decision, and that is something that you really need to think about quite a bit before you make your final move because those were more prominent moves. I didn’t see any vehicles for transporting people, but they do exercises, they play bingo, cards, and they had a library. Excellent accommodation. The only other care facility experience I have was with my grandmother, who was in Mistywood. She was actually in the independent all the way up until the end. I liked everything about the facility. The managers were great. Everybody who was there was great, very compassionate, very supportive. They were very accommodating to people who had different diets, but the food was always really good when we ate there. At the last month of her life, we ate there a lot, so it was nice, and while she was going through hospice, they were more than willing to bring meals up to us or let us come down. I can't complain at all about how she was treated while she was there. They had a lot of stuff. There was something going all the time. Every night, they had an activity where they could go downstairs and there would be something like a card game, and then throughout the day, they would have like a Wii bowling tournament here or a bridge tournament there, and they would take them on field trips to various places. Not only did they bus them to church if they wanted to go to church, but on Sundays they had a rotating minister who would come. It was a fantastic place for her. She lived there for nine years. Since it opened, she'd been there. I know that there are still several people who my mom kept in contact with. They still live there, and they have lived there since it opened. My mom has just moved in at Mistywood this October, and currently, she is pretty well adjusted there. We chose this facility because they have a lot more going for it. The building isn't horrible, old or dilapidated and their rooms aren't rundown too, but the people there are nice. The management and their working staff have been very nice as well. Regarding activities, they have a ton of stuff there to do. They do bridge, Wii games, and all kinds of card games. The whole family had a chance to eat there and the food was very good. It was real food and it wasn't shipped in like in the old place that my mother lived in. 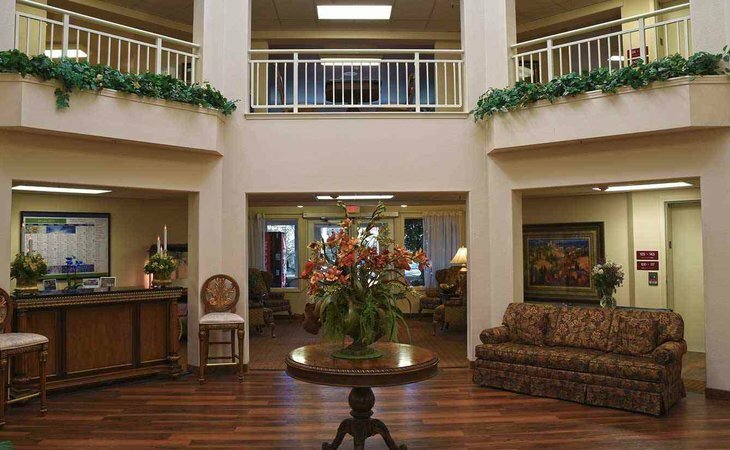 MISTYWOOD IS AN UPBEAT AND GREAT GROUPE OF RESIDENTS AND STAFF. EVERYTHING WAS CLEAN AND INVITING. FOOD WAS EXCELLENT AND NOT TOOOOOO MUCH FOR THE MEAL. THEY EVEN PROVIDE FOR A HALF PORTION WHICH IS GREAT.AS WELL AS HAVE OTHER CHOICES YOU COULD HAVE IN PLACE OF THE REGULAR MEAL. OVERALL I WAS VERY IMPRESSED WITH THE WHOLE APARTMENTS AND FACILITY. Mistywood is located in Roseville, CA, providing a vibrant backdrop for your new life as a valued member of our caring community. So come to Mistywood for a visit...and stay! What should caregivers and potential residents know about Mistywood?